This is complete speculation on my part, I have no insider information or any association with the movie production. 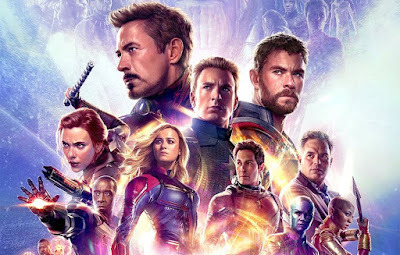 This blogpost works best as a follow-up to my original “Avengers 4 is Still Infinity War Part 2” post. We’ve heard Avengers Infinity War described as a “heist movie” and that Thanos is essentially the film's protagonists, we know in that regard the film is primarily about Thanos getting the Infinity Stones. In my original piece, I speculated that Thanos would be successful in getting all the Infinity Stones and that would lead to the Avengers having to deal with this in Part 2. Based on recent photos from the movie’s production it’s looking like part of the movie at least will involve revisiting scenes from previous movies, definitely the Battle of New York from the first Avengers film (therefore travelling through time). So if Infinity War is described as a “heist movie” then I think Avengers 4 will begin to be described as a “time-travel movie” and that is the big difference between the two, basically part 1 and 2 of the same story, yet two very different films in terms of structure. There is an argument, that rather than technically “time-travel” we will be going to different dimensions (ala the Multiverse), but I think it’s easier to sell mass-audience on time travel rather than multi-dimensional-travel or whatever you want to call it. So in summary Avengers Infinity War will result in Thanos successfully completing the Infinity Gauntlet and taking out a lot of our heroes in the process. Avengers 4 could focus on the remaining Avengers travelling through time (most likely using the time stone) to try and prevent that from ever happening. So what do think? Will Avengers 4 be a time-travel movie? Limited costs are not by any check-distance.com means the only favorable position however as they additionally offer flight overhauls, room redesigns, and VIP registration lines as required.